This is a highly theoretical question, but if you were to hand somebody in the 15th century a 15th century Albion sword what might their impression be? Do you suppose they may not be able to tell that it was not fabricated in the 15th century? Or do you suppose they might think there is something very odd with this sword, unlike anything they have seen, being that it was created in a time beyond their own? I know the basic construction methods are really not all that different, yet I have to wonder if you were to teleport an Albion back to that time, if it would stand out in some way, having a look and feel unlike the others around it. Probably to good to be true ! More attention to symmetry, uniform quality of steel and heat threat on the good side and maybe some VERY subtle handling characteristics somehow missed in research on the negative side. The Albion swords might be inferior to the top 5% of period swords but at least equal or better than the rest of the 95 % of munitions quality or average swords. I would say the same for A & A. A period guy might be very happy with the performance of an Angus Trim but would notice more things out of period. But I'm just guessing here: I'm sure Peter Johnsson would know were compromises were made to keep cost down that might be noticed by a careful look by someone in the 15th century looking for clues that something was odd. Not necessarily inferior to period just different enough in construction to raise eyebrows And get your time traveller burned at the stake for sorcery. Just bumping this one back up ( ONCE ) as I am curious about what the industry people opinions on this would be. One thing that would be noticed immediately is the lack of a grain to the steel. All iron and steel in Europe back then was wrought, that is to say a product produced from a bloom that had to be consolidated by welding and folding several times, which left a definite pattern. Here is an example of a recent one of mine made from iron made in a similar fashion to what would have been used. You can see that even though the surface has been polished up to 2000 grit, then buffed and finished with a paste type abrasive, the grain is readily apparent. You know this is actually very difficult to answer. I could make it simple and say: a 13th or 14th C man at arms would not see any difference at all between his sword and, say the Ritter, Knight or Landgraf (or your pic of the NG swords). But that is not very interesting and smacks of stupid marketing hype. To make the answer more problematic and thoughtfull will be very contrary to brand identity as there are so many shameless producers hyping their swords beyond all reason, making out to be historically accurate (while the reality is quite something else). I feel loath to contribute to a situation where substandard products are compared to what we try to do at Albion. Jean made a god attempt I think in answering this. Even if you actually make everything spot on there can always be tell tale details that taken together will show the sword to be "otherworldly". This is more a result of a crash of "cutlures" than anything else: like eating sushi by made by someone who never have been in japan, but has been taught her skills by a japanese cook. It can be mouthwatering and even "authentic" in style and taste but still give you a feeling of a "otherworldlyness", if you get my meaning. It is really all about the scale of the question. Are you concerned with "perfomance" and handling, or are you thinking about what sword from Master Picchinio´s workshop looked like in the years 1489-1492? What is it you are looking for in "authenticity". This tend to vary depending on your previous experience with the "real thing". My hope and ambition is that NG swords will stand to very critical comparison to surviving originals in mint condition. My ambition is that the variation you could experience is the same that is present between different historical excamples of the same type. When you se a NG sword patinated and covered with rust, there is actually very little to tell it apart from an aged original. I personally feel it is a shame talented people who enjoy personal patination projects do not choose to spend their time and labour on a good sword to start with. Take the Knight or the Gaddhjalt: bring that back in time buy applying patina and rust, and it would be very authentic looking indeed. I have handeled hundreds of orginal swords and documented a large number to high detail. Still, I cannot say what a 14th C person looked for in a sword. I can only look for those aspects I need to know to make a reconstruction according to my vision and ambition. There is a gap of some several hundred years that is impossible to bridge if we are seeking *ABSOLUTE KNOWLEDGE*. If I want to be really nit picking (and I tend to like that) it is very difficult to tell *EXACTLY*. What one maker consider being an "exact copy" another maker will label "free interpretation". Also important is what aspect of the sword you focus on as maker and consumer. It tends to vary depending on type and size of customer base, intended use of product, general price level and production methods. Over these last three years I have tried my best at this forum to convey what I see as important aspects for "authenticity" in a modern production or semi custom sword. We can seldom move away from the fact we have to use modern steels that demand their own treatment to show the best of their potential, so metallurgy must be disregarded in this discussion. Otherwise important aspects to me are: style, feel, character, heft, weight, dynamic aspects, performance/function as per type. All these matter equally much to me. I really do my best to make the designs be good representatives of historical types, to the best of my knowledge. This means I want to stray as little as possible from actual examples. A NG sword should convey the same feel as an original sword of the same type. How close Albion gets in producing this, I am actually not the person to say. I am proud to be part of the project and happy to see what is made in the Albion workshops, that is all can say. A respected curator of a museum, or a knowledgeable collector are the ones to critique the authenticity of the models in production. My word will always be partial however objective I try to be. I do not think it is a good idea to expect makers to be neutral about what they are doing. If anyone can fill in further I would be very interested to hear. It's a shame that Ewart Oakshott was never able to check out one of the Next Generation models. I don't think anyone is willing to put a patina on an Albion sword, Peter. They're just too nice for that. So ironically people will age a less historically accurate sword, and not get nearly as good a result. If anyone was crazy enough to age a top of the line sword it would be interesting to take it to a museum for an expert's opinion on how it compares to an original. Not to try and fool them, but to see what they think. I don't think anyone is willing to put a patina on an Albion sword, Peter. They're just too nice for that. Call me crazy, but I thought long and hard about getting a second Knight for this purpose... I just couldn't bring myself to age my only one. There are just too many other pieces I want that I don't yet have, and funds are going towards them when my financial situation allows (which, thanks to Katrina, stinks compared to a few months ago, sadly). Even Howy's personal Knight is antiqued only on the hilt - the blade is pristine. This is as far as I have been able to go with mine, too... leaving it to patina and darken, but not rust aggressively. The rest of my collection is being kept pretty and new. I think a Brescia done well would be awesome, too... but there's no chance in hell it'll be mine. My Brescia is, hands down, my favorite piece to handle. It's been about 6 weeks since I last picked it up... and I'm having a very hard time with that. Taking a well-aged Next Gen / Museum Line sword to a museum would be an interesting thing... the mark, though, would give things away very quickly if they recognized it. I would have to disagree on that point since the question also regards the "look". Since the materials have some definite, easily identifiable visual differences, at least some of the metallurgy must be considered. I have to wonder if you were to teleport an Albion back to that time, if it would stand out in some way, having a look and feel unlike the others around it. Well, I have to disagree with you, Jesse (Even if I understand you point: what you say have some validity, just not always and everywhere. Especially not in later periods). Making a broad statement that character of steel and heat treat always shows a different surface or character on historical swords compared to swords made from contemporary steel is simply not true. 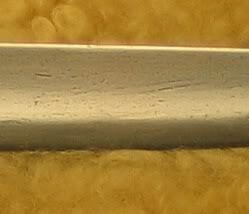 Attached is a pic of a late 15th c sword in prisitne condition. My bad, All the antiques I've seen (much fewer than you have, obviously), and all the iron I've smelted has had a grain even when polished. I stand corrected. I might be willing to do such a thing if I knew what I was doing, but I wouldn't go beyond a patina into actual rust, or pitting. One of the reasons that I am such a big supporter of Albion swords is the very fact that they closely replicate the look and feel of the originals. I've handled a fair amount of originals over the years, sadly not hundreds like Peter has but a fair amount. Without a doubt Albion swords come the closest to recreating that look and feel. There are other makers who do quality work in terms of performance and handling, but due to cost and manufacturing processes they tend to fall short of the mark in the 'atmosphere' department. This is also why I hold Peters work in such high esteem. Over the years I have owned many many modern replicas. Even most of the custom pieces failed to have the look of the originals. Even if they were quality swords they were simply lacking something in that department. High quality functional swords to be sure, but still obviously modern interpretations of originals. Much of this was due to aesthetic choices made by the maker. Peter is the only maker I've dealt with that seems to be committed to replicating the true 'atmosphere' of the originals. If I were to take that timewarp backward I don't think a 13th century european knight would find much of a difference between his new sword and my Johnsson. Patrick Barta is another one that I could say the same about, but I haven't seen enough of his work to say for sure. The one sword I've seen really impressed me in it's authentic appearance though. Would I ever artificially age one of my swords? I doubt it. My swords are real weapons, not wall-hanging decor and I handle them with that mindset. I've carried a weapon on a daily basis for years. Consequently I've developed the mindset that weapons need to be maintained and cared for, so allowing my swords to rust , patinate, or whatever you want to call it, is a bit offensive to my psyche. Still, there's nothing wrong with a little age on a weapon. One of the reasons I don't use products like Renaissance Wax is that I like a seasoned look. Not neglected or old, but over time the steel will take on a darker hue as it's exposed to the atmosphere and repeatedly oiled. This makes them look like they've lived a little. I like this look very much. However, when I've owned old swords I haven't felt the need to shine them up. Old swords have a history that is evident in every blemish and stain that should be preserved. Artificially aged swords don't have that history, they're just fake. One other factor that should be mentioned is the emotional reaction we get when handling the genuine article. We've often heard people say that modern swords are inferior because they lack the quality of the originals. This is often true, however, when pressed to elaborate people are often unable to quantify exactly what it is that's lacking. It can't be quality alone because not all original swords were masterpieces. I've seen some that weren't that impressive, and there was junk then as there is now. It can't be handling qualities either. Making a modern sword look and handle like an original is a matter of engineering and mathematics, not black magic. It takes skill to be sure, as well as a good deal of study, but it's not unobtainable. I firmly feel that part of it is the fact that you know you're holding a weapon with genuine history, something that was made to be used in earnest and probably was. You view the original differently because it is indeed an original and you're excited to get the opportunity. Consequently your mind is reacting in a totally different way than it will when handling a replica, regardless of the quality. This emotional factor is probably another reason why I don't care for artificial aging. My mind tells me that it isn't really an old weapon with history. It's just a faked up replica. Well, not to nitpick , but we don't HAVE to use modern alloys to make these out of, it's just more economical . I've done it;) Not to get too far off topic, but It's kind of neat to see the differences in the working properties of modern alloys, even simple steels, and real wrought iron. Don't take any of this the wrong way, I'm not trying to be troublesome or anything. I've got a tremendous amount of respect for you and the company you're associated with, and have learned a tremendous amount from the information you have so kindly posted for our collective benefit. Sometimes it's hard to convey tone in type, even with "emoticons" or whatever they are. Well, not to nitpick , but we don't HAVE to use modern alloys to make these out of, it's just more economical . If you want to sell swords to the masses I think you have to, at least if you're going to make a living at something other than selling swords to Donald Trump. Agreed - two different things... full-on custom pieces vs. semi-production. Mega-differences in processes, cost, treating, etc. I value both quite a lot. Interesting that you mention Albion because in this company I sense the curiosity of the experimental archeologist and the creative urge of an artist. The combination of these elements produces swords that could very easily fool the eyes and hands of the ancients IMHO. More than that, because they are made to combine the best elements of generations of artifacts, they would probably be thought the work of master smiths and cutlers (although they might wonder why such fine swords would have such plain grips and ungilded furniture.) I'll go even further and say that if a Museum line sword fell out of the 15th century sky the ancients would take it back to the very shop where its siblings were made. 1. Keep the weight down. These apprentice swords are tiring to transport and slower and more exhausting to use in battle, not to mention it is a waste of almost a pound of expensive steel per sword. 2. Thicken the blades at the forte and make then thinner for COP to tip. 3. Add a little more mass behind the cutting edge if your making a tool for armoured combat. You can keep the knife edges for cutting duelists and melons. 4. And those threaded pommels have to go. They keep coming loose at the most inopportune time. The grip components shift and loosen. This could be deadly in battle. You don't want to loose customers this way. When these threaded pommels are retightened it eventually puls out of line. It looks awful and hinders correct control of blade alinement in a cut. 5. Get some cord binding around the wooden grip cores (and for goodness sake find a hardwood tree) to help strengthen and stabilize them. And while we are on grips, they need to be thinner and shorter than most of the apprentice swords. Grips longer than the palm width (on single handed swords) shift forward and back turing use and hinder blade alinement as well as accuracy and power in the stroke. Fatter grips, may feel secure in hand, but while in motion they often reduce purchase and are more likely to fatigue the hand, especially when wearing gloves. 6. Please stop wasting hours and hours of valuable production time polishing the blade into a mirror. It creates a sense of vanity that turns to absolute frustration with the first blemish--simply by having to look at it or even more when the owner tries to remove it only to make it worse. Coarse sanding will do. It's quick and makes the removal of nicks and blemishes much easier.